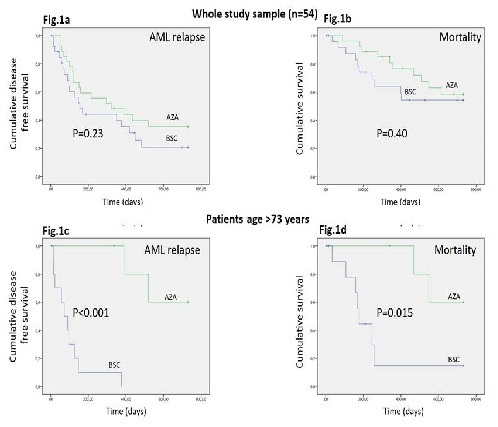 In elderly patients with acute myeloid leukemia (AML), complete remission (CR) rate following intensive chemotherapy is approximately 45%, considerably lower than in younger patients, with a shorter duration of remission and high treatment-related mortality. Median survival is 7 to 12 months. Several studies have suggested that maintenance therapy may improve survival. This phase III, prospective, randomized, multicenter trial assesses the efficacy of post-remission treatment with Azacitidine (Aza) versus best supportive care (BSC) in 54 AML patients >60 years of age in CR after induction and consolidation chemotherapy. Primary endpoint is the difference in disease free survival (DFS) at 2 and 5 years between arms; secondary endpoints are the difference in overall survival (OS) at 2 and 5 years, the number and length of hospitalizations and quality of life in the 2 arms in the 2-year post-remission period. Newly diagnosed AML patients with >30% blasts, "de novo" or evolving from myelodysplastic syndrome and fit for intensive chemotherapy have been included. Induction consisted of two courses of "3+7" (Daunorubicin 40 mg/m2 daily days 1-3 and cytarabine 100 mg/m2 daily continuous IV infusion days 1-7). Patients in CR received cytarabine 800 mg/m2 3 hour infusion bid days 1-3 and were randomized 1:1 to recieve BSC or Aza according to the following schema: 50 mg/m2 s.c. or i.v. for 7 days every 28 days and dose increase after 1st cycle to 75 mg/ m2 for further 5 cycles, followed by cycles every 56 days for 4.5 years. Enrollment has been completed with 149 patients of median age 69 years, interquartile range (IQR) 65-74 years, male/female 78/71. During chemotherapy, 59 patients were relapsed/refractory, 22 died, 10 refused to continue, 3 were excluded for protocol violation, and 1 was lost to follow-up. Fifty-four randomized patients (27 Aza, 27 BSC) are included in this interim analysis. At 2-years, the median period of observation was 15 months (IQR: 6-24 months) with 18 patients in CR. Nineteen BSC patients (median DFS 5 months) have relapsed versus 17 Aza patients (median DFS 11 months) (P=0.23, see Fig.1a). Twenty patients have died, all after relapse: 10 in BSC arm (median OS not reached) versus 10 in AZA arm (median OS not reached) (P=0.40, see Fig.1b). Age modified the effect of Aza on both relapse (P for effect modification=0.001) and mortality (P for effect modification=0.01), its effect versus BSC being not significant in patients in the 1st (<65 years) and 2nd (65-73 years) age tertiles (relapse, P=0.38 and P=0.47, respectively; mortality, P=0.23 and P=0.81, respectively) but highly significant in patients in the highest age tertile (>73 years) (relapse, P<0.001, Fig.1c; mortality, P=0.015, Fig.1d). Cytogenetics and minimal residual disease did not modify the effect of AZA on survival. At 4.5 years from randomization (median 15 months, IQR: 6-32 months), 15 patients are in CR and the effect modification by age on the effect of AZA versus BSC is confirmed with AZA showing significant efficacy only in patients >73 years of age (relapse, P<0.001; mortality, P=0.005). Grade 3-4 adverse events (mainly neutropenia) were more frequent in the AZA (18%) than in the BSC arm (0%)(P=0.051). Preliminary results indicate that in elderly AML patients receiving standard induction-consolidation chemotherapy, 5-Aza post-CR is well-tolerated and significantly prolongs DFS and OS. The trial is ongoing and may provide further insight on the impact of post-remission 5-Aza treatment on OS in this elderly population.